The Duluth, Missabe and Iron Range Railway (DM&IR) was a Minnesota institution that played a vital role in our country's steel production. While several Midwestern carriers moved iron ore in some capacity only the Missabe Road did so on a grand scale along a condensed network of just a few hundred miles. Its main lines fanned out northward from docks situated at Duluth and Two Harbors to serve the bountiful Mesabi and Vermilion Ranges. The discovery of this important resource predates the Civil War although contemporary mining operations did not begin until the early 1880's. In time, two railroads came to serve the region; the Duluth & Iron Range and Duluth, Missabe & Northern. After many years as separate entities the two merged in the late 1930's to form the modern Missabe Road. Over the years its system map constantly changed as it built, then removed, trackage while following the iron. As time passed the natural ore fields were exhausted which gave rise to the taconite pellet, a sort of man-made ore created from natural deposits. In May of 2004 Canadian National purchased Great Lakes Transportation, which owned the DM&IR, and within a decade its corporate identity vanished. Because of its unique nature the Duluth, Missabe & Iron Range carries one of the most interesting histories of any railroad. The company's existence was tied directly, and almost exclusively, to iron ore. In many ways, it differed entirely from its counterparts. Its heritage, ironically, begins with gold. In his book, "The Missabe Road: The Duluth, Missabe And Iron Range Railway," Frank King details how a gold rush hit Minnesota's Lake Vermilion region in 1865 when prospectors claimed they had stumbled upon the precious metal. This hope turned out to be unfounded and the flurry of activity had ended by 1868. However, a few individuals stuck around after noticing the red soil appeared to contain rich sources of iron. The most notable was George Stuntz who set into motion efforts that later became the Duluth & Iron Range, DM&IR's earliest component. He had heard stories from others regarding the tales of Indians who had told of finding iron in northern Minnesota for generations. Using this information, Stuntz tried, but was unsuccessful, in convincing capitalists to begin mining operations. Eventually, he got in touch with George Stone who informed him that a Professor A.H. Chester of Clinton, New York's Hamilton College was doing prospecting work for Philadelphia investors. 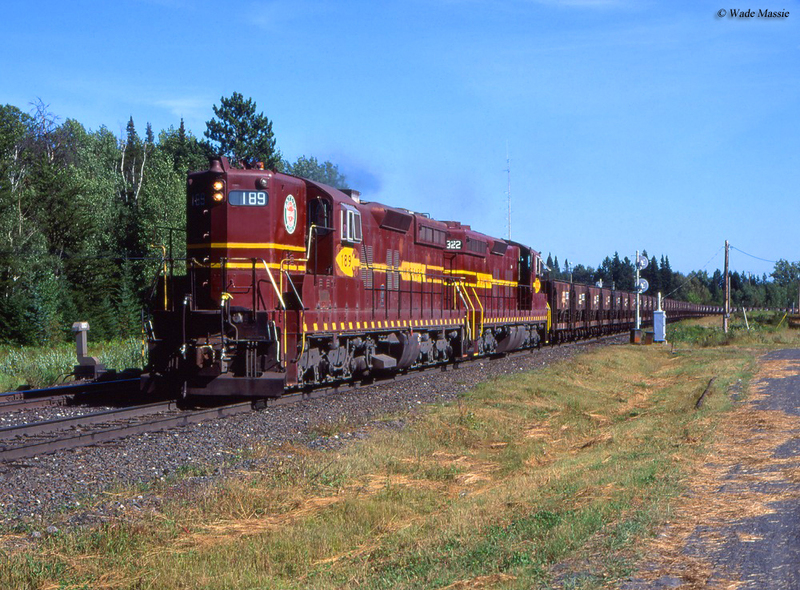 Canadian National, "The People's Railway"
Chester was not having much luck finding iron deposits in what later became the Mesabi Range (the word "Mesabi," sometimes carrying a slightly different spelling, is based from the Ojibwe/Chippewa Indian word meaning "sleeping giant"). That is, until he met Stuntz who had stumbled upon the abundant Vermilion Range. After studying samples the ore was proven to be roughly 65% pure iron, an extremely exciting prospect. While the metal is one of our planet's most abundant natural resources it is usually not concentrated in amounts greater than 35%. From the railroads' earliest days small iron mines had popped up throughout Appalachia and the eastern Midwest but were yielding relatively mediocre results. This was becoming a problem with iron's rapidly rising demand as railroads expanded and the industrial revolution took hold. It was Henry Bessemer of England, and William Kelly of Eddyville, Kentucky, who independently discovered an improved version of iron in the mid-1850's, steel. In laymen's terms, the process involved taking pig iron (metallic iron created through smelting) and blowing extremely hot air into the molten mixture. Doing so removed impurities, which made for a much stronger material. Over time, the processes of steel production have been further improved but these two individuals were the first to conceive a durable, relatively inexpensive product that remains in common use today. One of the investors who employed Chester was Charlemagne Tower of Philadelphia. Upon the professor's recommendation, Tower agreed to acquire lands in the Vermilion for mining operations. This also meant a railroad would be needed. 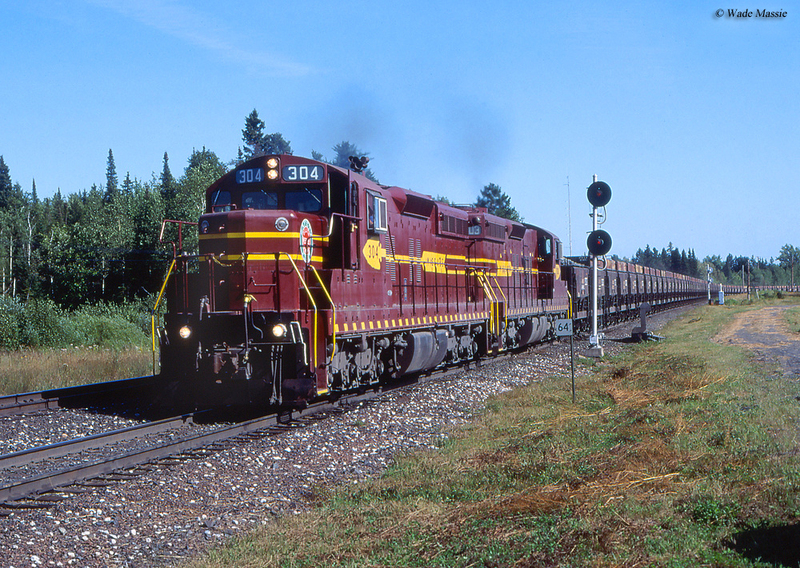 So, the Duluth & Iron Mountain Railroad (D&IM) was incorporated on January 29, 1881 for this purpose. Unfortunately, the group instantly encountered a snag. To help lower final construction costs they attempted to secure a swamp land grant statute but the state legislature balked at the request. By happenstance, another chartered-but-shelved railroad had been granted such standing, the Duluth & Iron Range Rail Road formed in 1874. This system was intended to link Duluth with a point near Babbitt. Tower gained control of the company in March of 1882 and set about changing the southern terminus to Agate Bay, which later became Two Harbors (incorporated on January 7, 1885). After a route was surveyed, construction commenced northward from Agate Bay with a short segment initially opened at that location on August 28, 1883. After nearly a year of construction the entire 68-mile line was completed on July 31, 1884, serving two early docks at Two Harbors, #2 (Completed first and opened that year it boasted a 16,000-ton capacity with 162 pockets. The structure rose 40-feet above the water and 644-feet into the harbor.) and #1 (finished in 1885 it carried 141 pockets capable of holding 18,000 tons). Along with the railroad Tower also incorporated the Minnesota Iron Company to conduct actual mining operations. This subsidiary also aided the railroad when-needed, such as building servicing facilities (roundhouse and maintenance shops) in Two Harbors. To commemorate the line's opening, 2-8-0 #8 handled the first trainload of ore on July 31st. Business remained slow for some time but by 1885 demand had quickened as more than 227,000 tons were shipped that year. What followed was a rapid succession of activity with construction of a third dock and another new line, the 26-mile Lake Division. This corridor linked Two Harbors and Duluth, opening in December of 1886. Unfortunately, just as Tower was maneuvering his operation to become a dominate iron producer, larger interests pushed him out of the picture. This group of industrialists, which included oil mogul John D. Rockefeller, carried a nearly limitless stream of capital. Threatening to build a competing line of their own, Tower capitulated and sold his stakes in April of 1887 for a total of $6.4 million. Under new ownership the railroad rapidly expanded, opening additional mining spurs and two more docks at Two Harbors for timber shipments. There was also line upgrades carried out, including double-tracking between Two Harbors and Allen Junction as well as a much needed realignment from Rollins to Waldo which reduced gradients from 3% to 1.5%. Finally, the D&IR reached the western Mesabi Range in 1892 when it opened an 18-mile extension to McKinley via Wyman (near Allen Junction). This put it direct competition with a nearby road with which it would later merge, the Duluth, Missabe & Northern. By the turn of the 20th century the D&IR was moving upwards of 4 million tons in raw ore annually. The two ranges for many years remained the largest concentration of natural iron deposits anywhere in the world (later eclipsed by Brazil and Australia). The railroad's future certainly looked bright as the product was in great demand for steel mills across the Midwest, from Illinois and Ohio to Pittsburgh, Pennsylvania and northern West Virginia. The D&IR, however, was not the only railroad the region; into the 20th century smaller mining companies were formed and the Great Northern was also putting down stakes as its leader, James J. Hill, sought his own slice of the riches. Most notable to D&IR's future was the previously mentioned DM&N. Its history began shortly after its counterpart's when Lewis Merritt and his sons discovered abundant soft ore near what was named Mountain Iron within the Mesabi Range during November of 1890. On February 11, 1891 the Duluth, Missabe & Northern Railway was formed to reach this location from a point known as Stoney Brook Junction (near Duluth) where a connection would be opened with the Duluth & Winnipeg Railroad (future component of the Great Northern), a distance of 48 miles. As John Gaertner notes in his book, "The Duluth, South Shore & Atlantic Railway: A History Of The Lake Superior District's Pioneer Iron Ore Hauler," at the time the DM&N had no dock facilities of its own for handling outbound ore. So, it reached an agreement with the D&W to do this via Allouez, Wisconsin, located slightly southeast of Duluth. Just like the D&IR, construction of the DM&N proceeded quickly and by October of 1892 it was ready for service. On the 18th of that month it moved its first load of ore and then proceeded to expand east and west of Mountain Iron to tap additional seams. After only a year of collaboration the DM&N ended its involvement with the D&W, electing instead to push southeastward for a direct link into Duluth. This new line opened on July 22, 1893. The company also built its own dock here, a massive contraption of more than 2,300 feet capable of handling 55,000 tons. Unfortunately, the Merritts' were hit hard by the financial Panic of 1893 and sold their entire operation to John Rockefeller in February of 1894. At the turn of the 20th century the country's steel industry began organizing into a series of large conglomerates. The largest was the United States Steel Corporation, created on February 25, 1901. It was the vision of banking mogul, J.P. Morgan, and brought together a laundry list of smaller companies. Many, but not all, were directly related to steel production such as American Steel & Wire and the National Steel Company. It also owned transportation holdings, which included the DM&N and D&IR. The ore docks served by the Duluth, Missabe & Iron Range Railway were massive works of engineering, towering some 70+ feet above the water and thousands of feet out into the lake/bay. In addition to the D&IR's original five wooden structures another was later added while the DM&N built six of its own. All fifteen are briefly mentioned here. The final, steel docks all carried four tracks on their deck. Dock #1: Completed in 1885 of wood, it held 18,000 tons via 141 pockets. Dock #2: Finished in 1884, constructed of wood: it held 16,000 tons via 46 pockets extending 644 feet into the harbor, rising 40 feet above the water. Dock #3: Opened in 1893 and built of wood it boasted 90 pockets. It was later rebuilt and lengthened in 1904/1905. Dock #4: Opened in 1893 and built of wood it carried a total of 168 pockets. Dock #5: The largest of D&IR's wooden docks, completed in 1895. It carried 168 pockets, rising 54 1/2 feet above the water. Dock #6 (Steel): The D&IR's first steel dock, opened in 1909. It was 920 feet in length, stood 74 feet above the water and carried 148 pockets. It held a total capacity of 44,000 tons. Dock #1 (Steel): This new structure was built entirely of steel and replaced the original Dock #1. It opened in 1911 featuring 224 pockets with a 56,000-ton capacity. It stood 75 feet above the water and 1,344 feet out into the bay. Dock #2 (Steel): Another new steel dock which replaced the original #2, it was completed in 1916. It stood 80 feet above the water and 1,368 feet in length with 228 pockets capable of holding 68,400 tons. The remaining wooden docks (#3 through #5) were taken out of service soon after all three of D&IR's steel docks were operational. Dock #1: Completed in 1893 of wood it extended some 2,304 feet into the harbor and 52-feet, 8-inches above the water. It carried 384 pockets with a total storage capacity of 55,000 tons. It was taken out of service in 1905. Dock #2: Completed in 1896 of wood it boasted 192 pockets with a storage capacity of 35,000 tons, later rebuilt in 1905. Dock #3: Partially finished in 1900 of wood this dock, which loaded its first boat on September 22nd, boasted 192 pockets. It was later rebuilt in 1905. Dock #4: This dock was constructed in 1906, the largest wooden structure operated by either the D&IR or DM&N. It held 384 pockets with a total capacity of 76,800 tons. Dock #5 (Steel): The DM&N's first steel dock was completed in 1914. Its specifications were: 2,304 feet in length, rising 80 feet above the water and capable of storing 115,200 tons. The structure last saw use in 1985. Dock #6 (Steel): The DM&N's final dock, #6, was completed during World War I in 1918. It was also 2,305 feet in length but rose an incredible 84 feet above the water with a capacity of 153,600 tons. It remains the largest ore dock on the Great Lakes. Coal Dock: Opened in 1909 it was 1,800-feet in length and 604-feet wide, capable of storing 650,000 tons. It was used as fuel for locomotives and general heating. The structure was dismantled in 1968. The two railroads remained separate corporate entities until a series of transactions in the late 1930s; first, the DM&N and Spirit Lake Transfer Railway (formed in 1907, this DM&N subsidiary eventually constructed 11 miles in the West Duluth area to serve a steel mill owned by the Minnesota Steel Company) were merged on July 1, 1937 to form the Duluth, Missabe & Iron Range Railway. Nearly a year later, the D&IR and Interstate Transfer Railway (also formed in 1907 as another DM&N subsidiary it was constructed to interchange with major railroads reaching Superior, Wisconsin) were added on March 21, 1938. When the country found itself dragged into World War II the DM&IR was ready to serve. According to John Leopard's book, "Duluth, Missabe & Iron Range Railway," it handled a staggering 339 million tons during the war effort. Despite this record tonnage the 1940's signaled a change as natural reserves were being exhausted. There was still plenty of iron remaining but it was locked up within taconite. This extremely hard rock was even more common than natural ore but for many years no one knew how to extract its valuable iron. That began to change during the 1930's and 1940's when methods were refined, which made taconite mining economical; the most efficient process involved shipping raw taconite to a plant, crushing the ore, and using magnets to separate iron from the waste material. To then ship the finished product, which contained more than 60% pure iron, bentonite clay was added as a stabilizer. After mixing the two ingredients, giant drums were used to create balls about the size of large marbles, which were then baked at 2,400 degrees Fahrenheit. This made the final product extremely hard and capable of being shipped over long distances. As it turns out, taconite pellets proved more desirable since they were uniform in nature, melted quickly in blast furnaces, and with a lower moisture content did not freeze during the colder months (early spring and late fall) as natural ore tended to do (this vexing problem meant that to extract the ore, workers had to pump steam into the jennies from small holes located near the bottom of the cars). 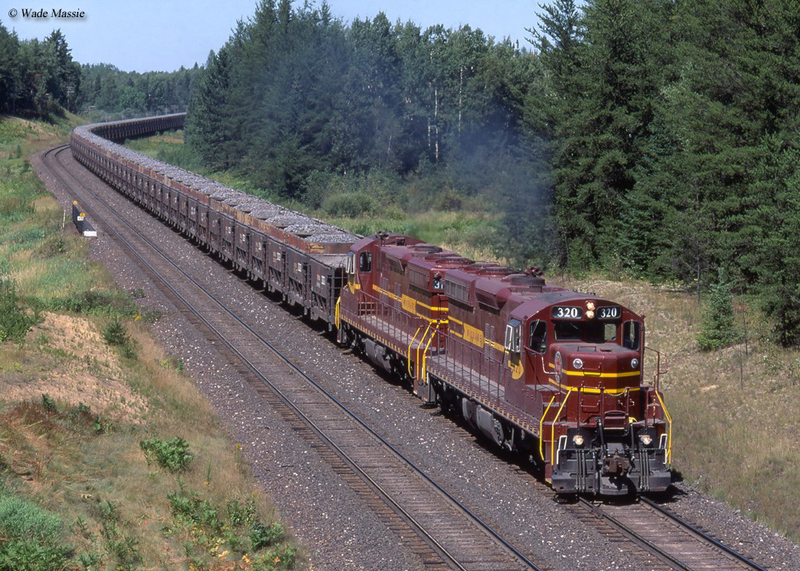 Taconite pellets shipped in ever-greater amounts after the 1950's and gave rise to the region's two other famous rail operations, Erie Mining and Reserve Mining. The Missabe did not delve heavily into the passenger business. It served a sparsely populated region, outside of Two Harbors and Duluth. The D&IR initially launched service between Two Harbors and Tower on August 11, 1884. This was followed by the DM&N between Duluth and Hibbing in 1892. When the the 26-mile Lake Division opened in 1886 the D&IR joined the DM&N and St. Paul & Duluth (later acquired by Northern Pacific) in serving Duluth Union Depot. Interestingly, until 1892 the DM&N, in conjunction with the StP&D, operated up to 15 daily commuter trains between Duluth and Lester Park. After the much more convenient Duluth Street Railway opened that year the suburban services were discontinued. 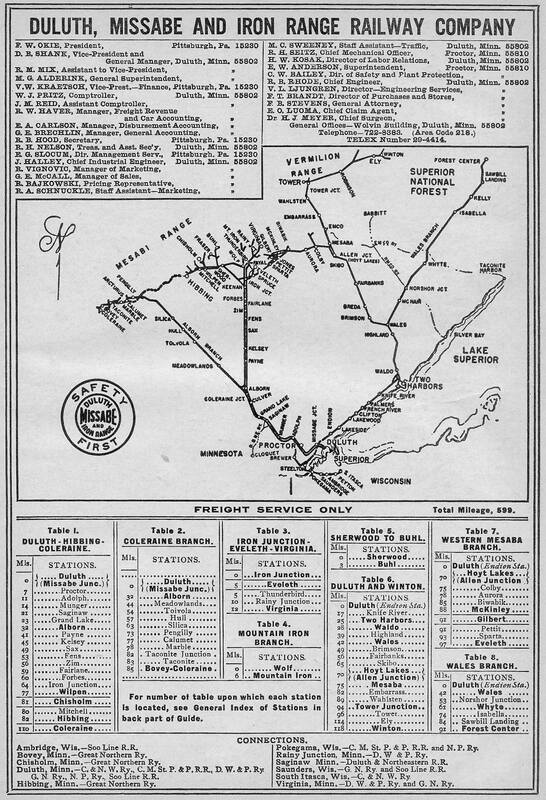 As early as 1923 general passenger service began witnessing reductions. The DM&IR acquired an RDC-3, #1, in 1953 to reduce operating expenses. The last remaining run on the Missabe Division between Duluth and Hibbing (Trains #1 and #2), was originally canceled on May 15, 1953. However, a court order forced the railroad to reinstate the trains on November 5, 1956. Curiously, it lasted only a year before permanently ending on December 31, 1957. Service on the Iron Range Division survived a few years longer when the Trains #5 and #6 (Endion/Duluth - Ely) were discontinued on July 15, 1961. The RDC was later sold to Northern Pacific in 1963. Throughout the years the Duluth, Missabe & Iron Range network constantly changed as the railroad followed the ore. Its primary main lines included the Missabe Division (ex-Duluth, Missabe & Northern lines) and Iron Range Division (former Duluth & Iron Range trackage). Both were largely double-tracked with branches spreading out like tentacles to serve the many mines of the Vermilion and Mesabi Range. If you would like to learn more about the entire, chronological history of the DM&IR network please pick up a copy of Mr. Leopard's book, which thoroughly covers this subject. One appendage worth noting was the Wales Branch. This 15-mile spur opened in 1917, running from Two Harbors to Whyte. It was the furthest eastern segment of the Missabe and served only the timber industry with an extension later opened to Forest Center in 1948. After World War II the Missabe Road began replacing its steam fleet with diesels ranging from Electro-Motive's SW9 switchers to SD9 road-switchers. However, steam managed to hold out long after most others had retired theirs with the massive 2-8-8-4 "Yellowstone's" surviving until 1960; that year #222 pulling its final train on July 5th. * Retired in 1892 and later sold to Chicago & Eastern Illinois. * #207 was later rebuilt to simple-expansion (non-Mallet) in 1930, reclassified as MS.
** #208 and #209 were rebuilt to simple-expansion (non-Mallet) in 1931 and 1937, reclassified as M-1S. *** #210 and #211 were rebuilt to simple-expansion (non-Mallet) in 1929 and 1931, reclassified as M-2S. * Ex-Union Railroad units, acquired in 1949. 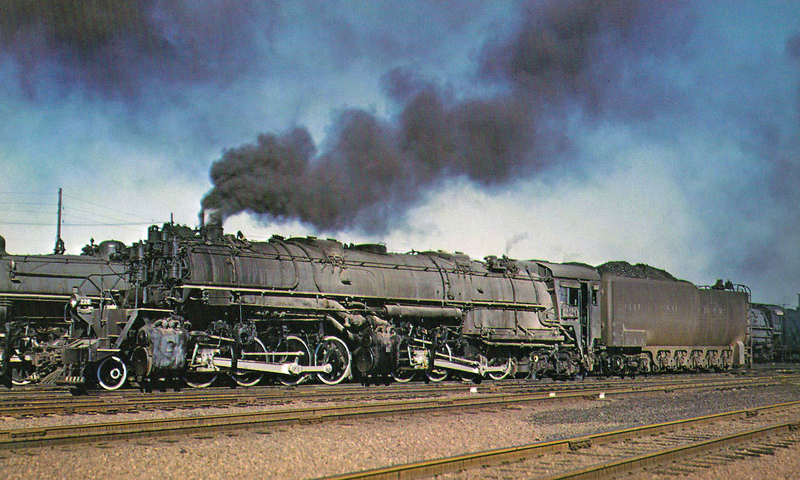 ** Ex-Bessemer & Lake Erie, acquired in 1951. Built as NP #406 in 1944. #MC-1: Built by the D&IR shop forces in 1926 utilizing a pair of Red Seal Continental 104 horsepower gasoline engines. The car was originally built as a combine by Barney & Smith Company in 1907 and given #19. #M-55: Built by the DM&N shop forces in 1927 equipped with two, Red Seal Continental 70 horsepower gasoline engines. The car was originally built as a coach by the Ohio Falls Car Company in 1901 as #55. #M-108: Built by the DM&N shop forces in 1928 equipped with two, Red Seal Continental 104 horsepower gasoline engines. The car was originally built as a coach by American Car & Foundry as #108 in 1908. #W-56: Built by the Missabe shop forces in 1939, carrying a General Motors 160 horsepower diesel engine. It was originally built for the Duluth Street Railway. #1: A RDC-3 model Rail Diesel Car built by the Budd Company in 1953, equipped with two 275 horsepower diesel engines manufactured by General Motors. Interestingly, the Missabe continued acquiring iron horses until 1951 when it picked up a batch of eighteen former Bessemer & Lake Erie 2-10-4's. As the steel industry waned after the 1970's, demand for taconite ebbed. With cutbacks and abandonment's carried out after this time, Mike Schafer's book, "Classic American Railroads: Volume III," notes that by 2002 only 212 miles remained in service. In 2001 the Missabe, along with the Bessemer & Lake Erie, U.S. Steel Great Lakes Fleet, and Pittsburgh & Conneaut Dock Company were spun-off into a new subsidiary known as Great Lakes Transportation. Canadian National eyed this property, largely for the DM&IR, since the Class I had long sought a 17-mile segment of its Interstate Branch for providing a through route into Chicago. The transaction was completed on May 10, 2004. For a number of years the DM&IR remained a separate entity but finally disappeared during a corporate reshuffling in December of 2011 when it was merged into CN-subsidiary Wisconsin Central, Ltd. For a railroad whose network peaked at just over 500 miles and dependent upon nearly a singular source of traffic, it is quite surprising how long the Missabe survived; a testament to the demand for iron and its role in developing our great nation.